The Magic Sunrise Club is A Luxury Resort Village Between Desert and Sea. a fabulous resort village awaits you, the likes of which you've never seen before. 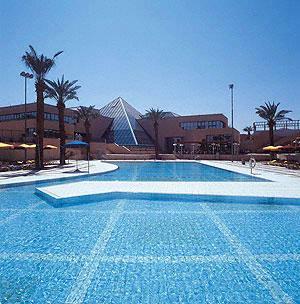 The Magic Sunrise Club Eilat is a deluxe, 5-star two-story resort, spread on 70 dunams of lush green grounds. The Resort offers sports facilities and swimming pools, laden with luxuries, and offering a magical desert atmosphere, a never-ending list of recreational activities for the whole family, and first-class hospitality. The hotel offers 279 guest rooms in 25 separate two story Hacienda style units , Tennis & Basketball courts ,a luxurious Spa and Fitness room, ,outdoor swimming pool & the only heated indoor swimming pool in Eilat . Our guests enjoy 4 meals a day , drinks (soft and local alcoholic), entertainment and activities for parents and children such as: jeep tours,wall rappelling , and more, as well as Kayak & Paddle boats on the beach.The hotel offers a professional soccer field (110x95m) built precisely according to stringent international regulations and equipped with the latest in floodlight technology.There is hourly transportation to the beach and downtown Eilat. At The Magic Sunrise Club, Everything is Included in the Price 24 hours a day -No Restrictions! 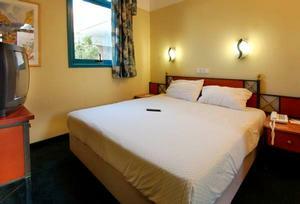 Room up to  4 Persons. -	Sunrise Suite up to  5 Persons. The Magic Sunrise Club is A luxurious resort village situated between the sea and the desert offers you a new vacation concept. The Magic Sunrise Club Eilat combines a never-ending list of recreational activities for the whole family with the tranquillity and breath taking views of a magical desert landscape.Opposite the enchanting view of the Gulf of Eilat at the northern approach to the city (5-7 minutes driving),near Kibbutz Eilot.